Inside St Joseph’s Shrine. Click to enlarge. 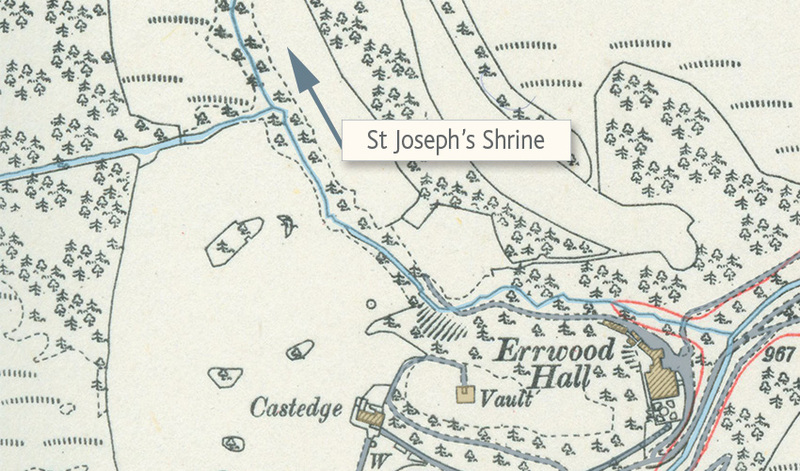 My old OS maps of the valley don’t extend as far as St Joseph’s Shrine. But I’ve shown on the map the direction from Errwood Hall. It’s easy to find – see my Goyt Valley walk 4 for details. You can also walk (or drive) up the old Roman road, The Street. The shrine is just a short walk from the road. 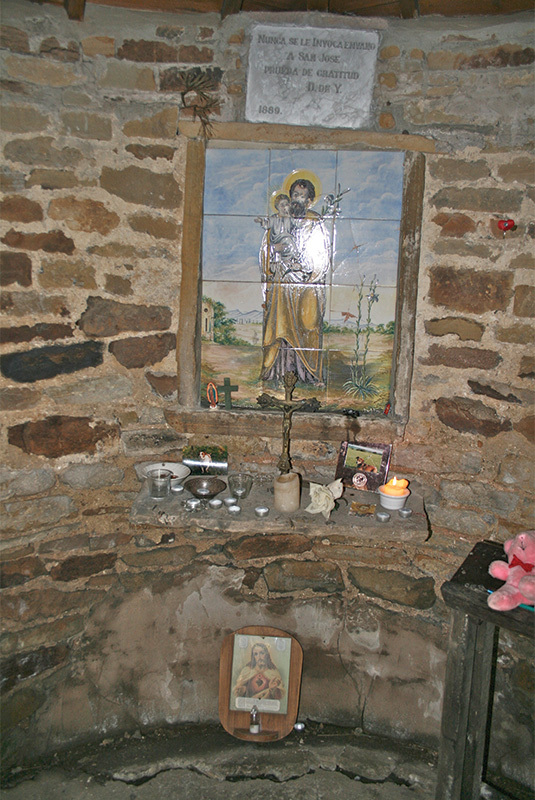 The Shrine is situated to the rear of the Hall, some three quarters of a mile from the ruins of Castedge Farm. Those who make the trek up the steep winding track do not go unrewarded, for the Shrine is glimpsed quite suddenly, hiding almost secretly among a few weather worn pine trees. 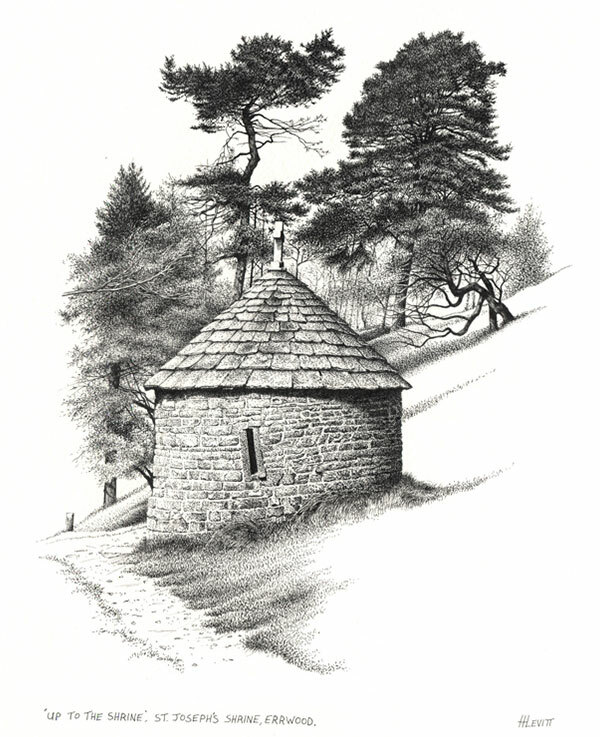 A small round stone building with a conical stone roof, and a strong oak door, standing here quite alone to all the elements. Perhaps sheltered a little by the rough pasture of Foxlow Edge and the pine forest reaching tip to Pym chair. Here in the peaceful seclusion, the walker may pray among the freedom of the surrounding hills. When the oak door is opened, directly in view is the small altar with St. Joseph pictured holding Jesus as a baby. The coloured glazed tiles, of Spanish origin, were set here at Errwood in a wooden frame before being assembled in the Shrine. Just above the picture of St. Joseph is a small marble slab with the carved inscription, ‘Munca se Ic Invoca evano a San Jose prueba de gratitud‘ (No one asks in vain of St. Joseph, a token of gratitude). Fresh flowers are placed on the altar at regular intervals, though by whom no one knows. The ruined farm, close to the shrine, was known as Withenleach Farm and was last occupied in 1835 by one of the Hibbert family. Click here to read about the damage to the tiles showing St Joseph carrying the baby Jesus. 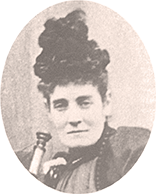 And Mary Grimshawe’s reaction to the desecration. I recently came across this wonderful line illustration of St Joseph’s Shrine on display in Buxton’s Tourist Information Centre (click to enlarge). It’s by Howard Levitt and prints are available to purchase from his website.